Amazon.com Price: $7.77 (as of 2019-04-25 14:38:05 GMT) Product prices and availability are accurate as of the date/time indicated and are subject to change. Any price and availability information displayed on Amazon.com at the time of purchase will apply to the purchase of this product. >>>>>>>>>> ALERT <<<<<<<<<< Some Sony Pictures Home Entertainment product with UltraViolet may have inserts included in our Blu-ray and DVD packaging with expiration dates that have passed. Please note that we have extended the expiration date for those UltraViolet redemptions to December 31, 2017 and we will continue to honor those redemption codes until at least December 31, 2017. For any questions regarding this topic, please contact your sales representative or SPHE Customer Service at 877 SONY-4YOU (1-877-766-9496) or via email customer@sphecustomersupport.sony.com. SPHE’s Consumer Care Team is also available to address any related inquiries appropriately. Please feel free to direct consumers to consumer@sphecustomersupport.sony.com with any questions or concerns. Prepare for non-stop excitement and pulse-pounding excitement in this “electrifying thrill ride” (Jeff Craig, Sixty second Preview). Colin Farrell stars as Douglas Quaid, a factory worker who visits Rekall, a revolutionary company that can turn his superspy fantasies into real memories. But when the procedure goes horribly wrong, the line between fantasy and reality blurs as Quaid becomes a man on the run and the fate of his world hangs in the balance. 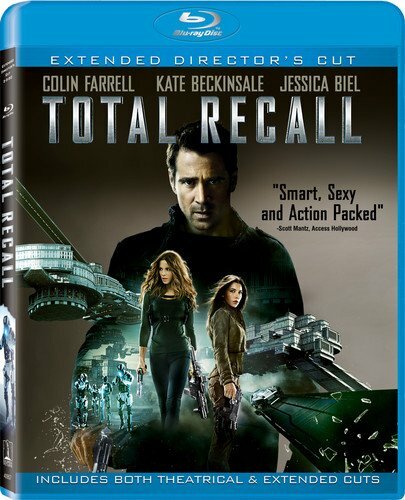 Costarring Kate Beckinsale, Jessica Biel and Bryan Cranston, TOTAL RECALL is bursting with mind-blowing action sequences and spectacular visual effects, the ultimate high-energy thrill-ride!